Most fatalities occurred between the hours of 4:00 pm. and 8:00 p.m. The majority of bicyclists killed or injured were males. Even if the driver was uninsured, you may be able to seek compensation from your own auto carrier under the uninsured/underinsured motorist provisions of your policy. We review each policy with a fine-tooth comb to ensure that all avenues of compensation are pursued. If you or a loved one has been injured in a bicycle accident, one of our experienced bicycle accident attorneys will meet with you to thoroughly discuss and evaluate your case. If your injuries prevent you from coming to our office, we will gladly come to your home or the hospital. 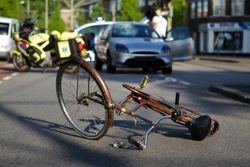 We handle all bicycle accident cases on a contingency basis so we only get paid if we recover money for you. We advance all case expenses including filing fees, court reporter fees, expert witness fees, etc. You do not have to pay anything out of pocket to pursue your case. If you would like to discuss a potential bicycle accident injury claim, please contact us online or call us at 615-742-4880 or 866.812.8787 for a free, no-obligation consultation. We have recovered more than $100 million dollars for our clients, and we would like to help you too.